Mortice & Green provide wooden window repairs and replacement throughout all London regions including North London. 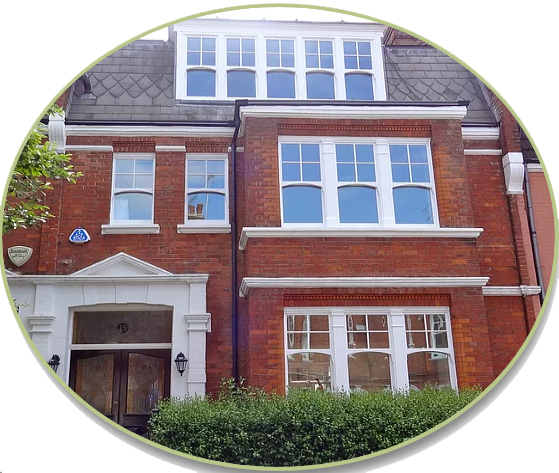 Having more than twenty years of sash window repair and replacement experience and being located in central London we are probably one of the best sash window companies in London to choose for your North London property. We have many satisfied customers in virtually all parts of North London so providing you with local excellent references from our previous clients is not a problem whatsoever. A full list of all the postcode areas in North London we cover can be found at the foot of this page, we may also consider working even further afield if we are able to, give us a call for more information as we love to help! The capital of England (London) is a bustling, modern metropolis with a history that dates back many centuries. Long before London’s urban sprawl absorbed the communities of Finchley, Wood Green, and Islington, the area now known as North London was little more than open fields. During the 17th century, White Conduit Fields in Islington played host to aristocrats and titled gentlemen as they competed in cricket before thousands of spectators. More people expanded to this area during the 1800s with the introduction of Regents Canal. Later on, during the early part of the 1900s, the railway led to a drastic increase in London’s population from a little more than a quarter million to in excess of 1.5 million residents. Eventually, even the then remote areas of Whetstone and Edmonton were engulfed by the local suburban sprawl. Alexandra Palace, or Ally Pally, as it is affectionately known by Londoners, is a Victorian structure that was originally opened as a people’s place in the late 19th century. It lasted just 16 years before closing its doors until 1936 when the BBC resurrected the building and used it as the site of the world’s first ever television broadcast. The site now plays host to sporting events, live performances, and exhibitions and also boasts a deer enclosure, ice rink, and lake. Islington is at the heart of the region’s creative hub and offers many ways to enjoy the local culture. Area theaters offer a mix of genres and include Almeida Theatre, Millfield Theatre, and Jackson’s Lane, a multi-faceted arts center that leads the UK in supporting and promoting contemporary circus. Jackson’s Lane is home to a wide variety of entertainment options appropriate for viewers of all ages. Dance enthusiasts can take in everything from classic ballet to contemporary choreography at Sadler’s Wells. Foodies may be interested to know that the capital city’s first farmer’s market sprang forth from the streets of Islington. Ottolenghi was the first restaurant to open here and it is still in operation today. It attracts a fair number of theater goers due to its location across the street from the Almeida. Popular chain eateries and independently owned restaurants line Upper Street and offer everything from local to French, Italian and Turkish cuisine. Camden Passage is a mecca for shoppers, especially those seeking unique treasures, both contemporary and vintage. Still one of the best places in England’s capital to find precious antiques, Camden Passage offers a diverse shopping experience with everything from handmade food delicacies to original artwork, retro jewelry, and contemporary men’s and women’s fashions. Certain days of the week are designated market days when independently owned market stalls line the streets with even more good to entice buyers. Arsenal Football Club celebrated its 100th anniversary in 2013 and has played at Emirates Stadium on Holloway Road since 2006. The stadium offers regular self-guided audio tours in addition to special premium experiences hosted by club legends when schedules allow. The on-site museum is filled with club related memorabilia spanning the organization’s 100 years in competition. The London Canal Museum provides insight into two different industries. The first, as the name suggests, focuses on the history of the canal system including the cargoes and the people who tended them. Because the site is the former ice warehouse built for the famous ice cream maker Carlo Gatti, the museum also presents the history of ice cream and the ice trade. Highgate retains its village-like ambiance and offers a variety of interesting places to explore. The name references a tollgate that once stood at the village’s location. Built during the 1500s, Lauderdale House has endured the centuries despite a fire that threatened its existence during the 1960s. Adults and children can participate in creative writing, drawing, or drama courses offered at Lauderdale House, which now functions as a center for arts education. Waterlow Park surrounds Lauderdale House and survives as a living gift from wealthy industrial magnate Sir Sidney Waterlow to the public in the late 1800s. The gardens include fragrant roses, water features, a putting green, children’s play area, and tennis courts. Summer nights are alive with music as artists treat visitors to an open-air concert series. Highgate’s cemetery is an unlikely but popular place for historians and anybody who has an appreciation for fine funerary architecture. Buried within the confines of the cemetery are such well known personalities as author George Eliot, philosopher Karl Marx, and English physicist and chemist Michael Faraday. The cemetery offers guided tours all year round for the morbidly curious. The cemetery opened in 1839 and contains some of England’s best funerary architecture. These treasures would likely have been lost if not for the efforts of The Friends of Highgate Cemetery Trust, who banded together to save the property from decline during the 1970s. Along with Bluebell, Coldfall, and Queen’s Woods, Highgate Wood is one of four ancient woods contained within the London Borough of Haringey. It spans 70 acres and is mentioned in the Domesday Book, a land survey ordered by King William the Conqueror and completed in the late 11th century. The wood was the site of the hunting estate owned by the Bishop of London during Medieval times. Today, the wood is home to a children’s playground, an information center, a cafe, a football pitch, and a cricket field. It is one of less than a dozen designated Green Heritage Sites in London. London’s extensive public transport system makes it convenient to get around to town without dealing with driving through heavy traffic. The underground tube service has three main lines that service the areas north of the city. These are the grey (Jubilee), royal blue (Piccadilly), and black (Northern) lines. Overground rail service links to the underground Northern and Piccadilly lines at the station located at Kings Cross/St. Pancras. The city’s colorful double-decker buses offer a scenic and inexpensive way to explore all areas, especially when speed is not a factor. Travelers can purchase single journey, daily, weekly, or weekend travel passes for the transportation option of their choice. Combined tickets for buses, tubes, and trains are also available and sold in designated zones.